Monitored, tested and certified – accordig to DIN EN ISO 16949. 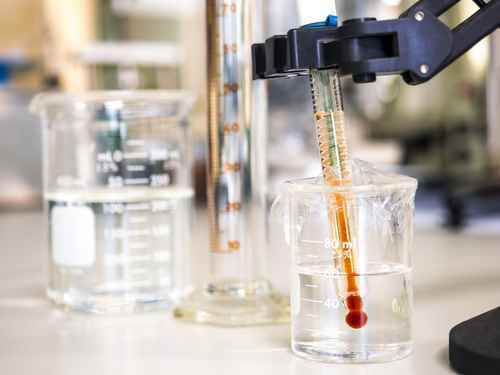 This is all based upon an in-house test lab, committed and highly qualified employees, and our understanding of quality assurance for all production and testing processes. 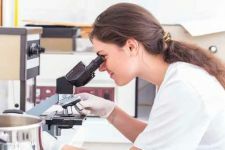 Wheth er BSE, Nitrofen or foot-and-mouth disease - recent scandals such as these have lent emphasis to the call for product labelling and consumer protection. However, at best, the labelling of a product serves as a pacifier. Reliable safety can only be guaranteed if requirements are not unrealistic, and meet people's needs. The DGM's comprehensive quality concept, with its quality assurance and certification regulations and comprehensive testing procedures, take these aspects into account. What about the Quality Mark as such, though, how is that protected? 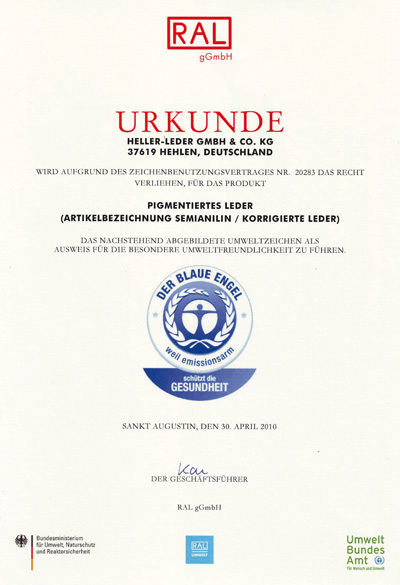 The quality assurance and certification of furniture is deposited and monitored at the administrative office of the Deutsche Gütegemeinschaft Möbel. Verification of the quality assurance "Golden M" is documented in the so-called certification license. Traders are permitted to advertise the fact that they supply furniture which has been awarded the Quality Mark. However, both advertising materials and showroom display may feature the Quality Mark only in connection with the products that have actually been awarded the mark. So this quality mark does not only proofs the bought quality but outstanding service for the customer. Openness and transparency is obligatory for both, towards the certification as well as the products. improves profitability, productivity and working conditions. is an integral part of the overall company policy and company strategy. is geared towards the implementation and compliance with all relevant laws, regulations and energy-related requirements. All relevant information is kept up-to-date at all times. states that the company is using modern processes, plants and machinery to achieve continuous improvements in energy performance. Energy saving measures are planned, implemented and the results monitored. is the constant updating and verification of our defined strategic and operational energy targets by the company management with the help of a certified energy management system. The necessary resources are made available, employees as well as contractors are involved. The energy consumption is systematically recorded, energy flows are recorded and kept up to date. is a commitment to energy-efficient action as a key management task. Continuous training and an open communication involve our employees to implement our energy policy. This includes appropriate and effective technological, organizational and behavioral measures. is regularly evaluated and reviewed. In an open dialogue with our employees, we inform and communicate the contents of our energy policy. DIN EN ISO 9001 defines the general requirements of a quality management system. The purpose of this standard is to ensure companies have the ability to meet quality requirements and therefore improve customer satisfaction. The ISO / TS 16949 is the internationally accepted used quality management standard for the automotive industry. This standard is accepted by all automotive manufacturers and bases on the ISO 9001. All additional branch-specific requirements are defined in the ISO/TS 16949. This certificate is the approval of passing an extensive environmental audit by the BLC (British Leather Technology Center). The audit is focusing mainly on chemical and environmental impacts of the leather production processes. These are measured, evaluated and verified. The impact of these processes on employees is also considered. GOLD is the highest achievable status and HELLER-LEDER was the first tannery in Europe to receive this award. This certification allows a worldwide comparison. Since 1978 the Blue-Angel is a quality mark for products and services which are rated as outstandingly environmental friendly. In cooperation with the Federal Environment Agency HELLER-LEDER has defined the criteria for the evaluation of the product “furniture leather” and consequently received the new Blue-Angel eco-label as the first company worldwide. The climate change is one of the central worldwide challenges of todays society. To reduce the risks of the global warming for human kind and nature, the average temperature increase must be limited considerably worldwide until the end of this century. 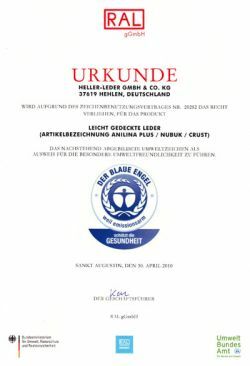 The German Leather Federation felt obliged to this commitment as well and presents with the ECO₂L label (energy controlled leather) the world’s first calculation and auditing model for determining the energy efficiency and the CO₂-emission of a tannery. ECO₂L was developed by the Forschungsgemeinschaft Leder (Leather Research Foundation) as an active contribution of a responsible leather industry towards climate protection and as a significant aspect to evaluate a sustainable leather production. 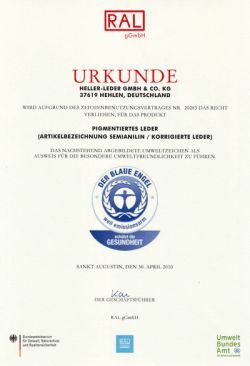 The ECO₂L certificate is assigned by the independant Forschungsinstitut für Leder- und Kunststoffbahnen gGmbH (FILK). Auditing is conducted on behalf of FILK by independent, officially appointed auditors.